This option is used to show a voting poll on the frontend. How to Enable ? To Enable the Poll feature on the front page, enable the poll option from Jomsocial configuration panel. Open Poll > Poll Settings to enable them. All Polls - Allows admin to publish, unpublish and delete a poll from a list of all poll. 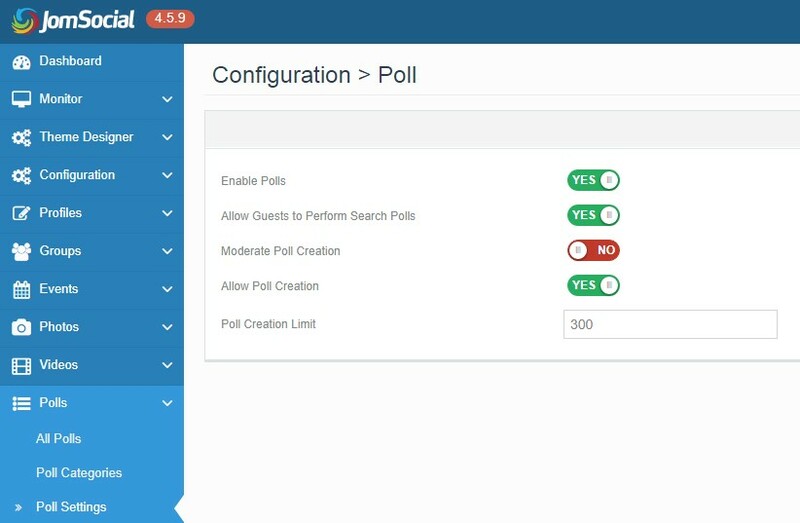 Polls Category - Allows admin to create a new category or modify already created category for poll, In this panel, admin can create different categories for the poll. Enable Polls - Enable ro disable the poll option on site. Allow Guests to Perform Search Polls - Allow a guest user to perform a search in the poll.. Moderate Poll Creation - Enabling this option will set the created poll in a queue for admin approval. Allow Poll Creation - Allow this option to allow a user to add a new poll on site. Poll Creation Limit - Set maximum no. 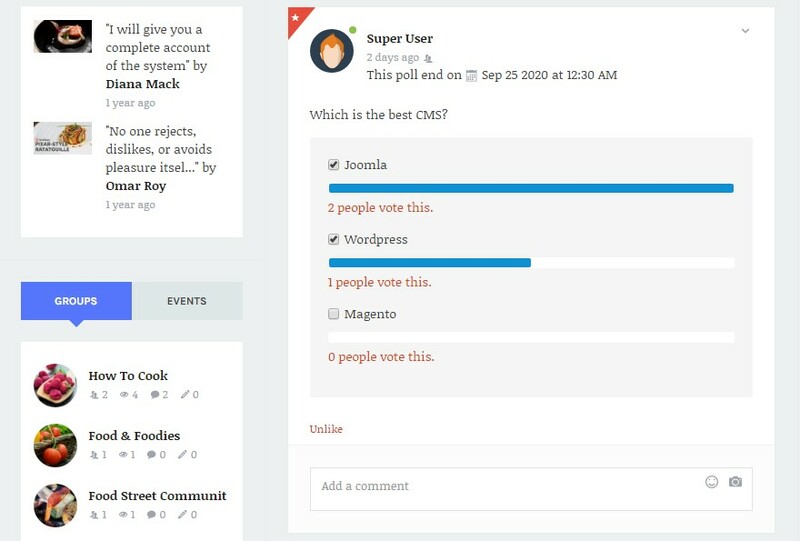 of polls a user can create, set 0 for unlimited..
Jomsocial gives full control over the poll using Joomla ACL. You can allow/disallow Joomla user group to not create,edit or delete a poll. To make changes in access level, open JomSocial > Configurations > Access Control and configure. 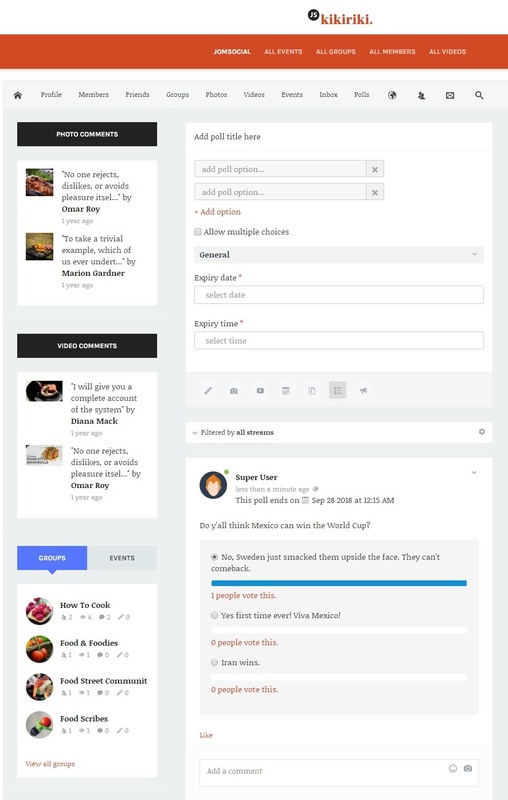 To add Poll Menu on site, Open Menu manager > Add new menu item > community > Polls. There is a different type of poll menu you can add on site. Poll options : - add poll options. Allow multiple choices: - tick the option to let user select multiple options in the poll. If not, user can select 1 option only.